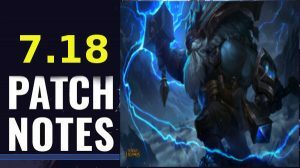 The League of Legends meta has undergone many transformations during Season 7, but now patch 7.18 is the official patch of the LoL Worlds 2017 and already gives hints, which champions will be particularly popular at this year's LoL World Championships. In the previous patch there was a release of a new champion, the mountainsmith Orrn. When it comes to the fans, new champions should be played in the pro-scene immediately, but Orrn had an absolutely terrible start and shows a negative win rate (<50%) on all roles. Riot tried to work on this problem in 7.18. In addition, the tanks are being nerfed a little bit, who have been an absolute supremacy in the past few weeks and who usually don't delight the fans. Of course, you can't expect Riot to completely change the game just before such a major event. Nevertheless, a lot of changes have been made, so we don't want to waste any more time and discuss the new patch in detail. Ult-Plays from Azir are risky and should be rewarded. Therefore, the base damage of Imperial Phalanx is increased at level 2 and 3. More and more players have been betting on a defensive item build with the Abyssal Mask lately, but they were able to do a lot of damage early on. Due to reduced base damage and better scaling, players will have to buy more ability power to be useful in lategame. From Riot’s point of view, Elise’s dominance in Earlygame is not punished enough in the later game, so her base damage is reduced and the cooldown of her E is increased. Basically, this is only a reversal of the changes from patch 7.14, because the bramble vest has become a standard item for top laners and is causing Fiora big problems. Fiora once again gains Duelist’s Dance movement speed bonus while in Grand Challenge’s circle. Gnar is again a solid pick in the toplane and it is usually difficult to exploit his weaknesses. For this reason, base health is reduced in mini form. The drunken, fat man is back in the jungle and proves once again to be overpowered. His base armor and the collision radius of his E are therefore lowered. The guardian of the jungle was a welcomed guest in the professional scene some time ago. After a few nerfs, he disappeared completely from the meta, and now his old strengths are being returned to him. The changes to Jarvan are small and affect his W shield. In competitive game, Kalista is banned in almost every game, which is a pity, because many of us would like to see the champion in action. The Cooldown of the Ultimate is therefore raised slightly. The blind monk has no place in the current meta. This is also due to its weakness in 2v2, which is now to be eliminated by its improved shield. Lucian has become an irreplaceable part of the Midlane. This is due to his strength in 1v1 and his mobility. The latter should now be slightly tuned down. Recently, the mana cost of Nautilus’ abilities has been increased to weaken his Waveclear, but Riot’s changes were too harsh and now they lowers the cost of “Dredge Line”. New: Hitting terrain also refunds half of Dredge Line’s mana cost. Another almost forgotten is Nidalee, who brings good damage and fast Jungleclear with her, but no utility whatsoever. Therefore, the rate of healing is increased. As mentioned above, Orrn has had a difficult start since his release. During patch 7.17 some minor changes have already been made to his base stats, with 7.18 comes now the last final touches, which hopefully will make viable for LoL Worlds. Ornn’s Masterwork upgrades are now locked until he reaches level 13. Zhonya’s Hourglass can now be Forged into Zhonya’s Paradox. So far, Rakan has been able to activate his ultimate and thus increase the jumping speed of his W considerably, this rate is now lowered. Some time ago the hunter was still very dominant, then he got nerfed to the ground. His early game is now to be improved a little bit to give him a chance to get into the game. The rune mage was truly nerfed to death. Increasing the W-scaling should counteract this, but will not be enough to make Ryze attractive for LoL Worlds champion pool. Little Yordle has become an inherent part of the meta. The other crit ADCs were almost completely replaced and Riot doesn’t like that at all. As mentioned above, tanks are currently too dominant in the Jungle. One of the support items that are currently in use on all positions. Riot wishes for more variety.